Unfiltered. Unapologetic. 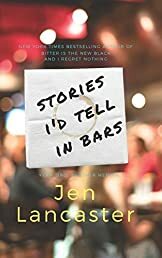 Older - but arguably not wiser - Lancaster gets back to basics in this hilarious essay collection about everything from taking community policing classes to accidentally getting stoned with her waiter after a fancy dinner. These are the tales she'd tell if she met you in a bar... if she weren't too lazy to put on pants and go to a bar. Offering advice ranging from how to remain happily married to a man who refuses to blow his damn nose already to not creating An Incident at the cheese counter during an attempt at Whole30, she's you, only louder. As she details the chaos that will surely ensue if she has to learn to operate one more television remote control, you'll want to settle in and pour yourself a tall one. Because what's more fun than hearing a friend share her favorite stories?